Robert Leslie Goode (June 5, 1927 – June 9, 2007) was an American football running back for the Washington Redskins and the Philadelphia Eagles of the National Football League. 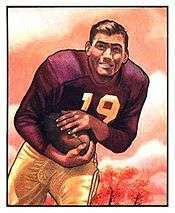 He played college football at Texas A&M University and was drafted in the first round of the 1949 NFL Draft by the Redskins. He was also drafted by the Chicago Bears in the 15th round of the 1948 NFL Draft and the Buffalo Bills in the 16th round of the 1949 AAFC Draft. ↑ "ROB GOODE". profootballarchives.com. Retrieved December 10, 2014.